Social Welfare Chair Laura Abrams, right. UCLA Luskin’s Social Welfare doctoral program is one of the top three most productive in the nation, according to a newly published study measuring the impact of faculty research. “The search for meaningful metrics of program excellence has been a longstanding effort by social work schools and colleges,” the researchers said. To understand variations in faculty productivity, they built upon previous work analyzing scholarly citations by considering the impact of a program’s funding sources, regional location, year of establishment and faculty demographics. “Researchers are not expected to build knowledge in a vacuum,” the study said. 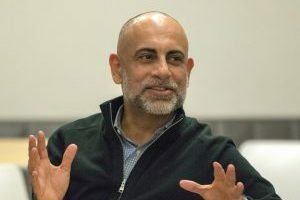 “Rather, it is a professional expectation that researchers also demonstrate the ability to disseminate knowledge widely despite the narrowness of their specialty area.” The analysis found that the three most productive social work doctoral faculties were based at public universities in the West: the University of Washington, UC Berkeley and UCLA Luskin. “One surprising finding was that there were significant differences among programs with the same size but located in different parts of the country,” the researchers said. “Why Western and Midwestern programs outperform their Northeastern and Southeastern counterparts is unclear.” The research, published in the journal Scientometrics, was based on empirical data from the entire population of doctoral tenure-track social work faculty at 76 research-oriented universities. The community garden launched by the Watts Leadership Institute (WLI) a year ago is growing, thriving, bearing fruit. The same could be said for the institute itself. Since the start of 2018, the UCLA Luskin-based WLI has received several grants totaling more than $650,000 that will allow it to expand its core mission of empowering the community leaders of Watts. Along with Karrah Lompa MSW ’13, Leap founded the institute in 2016 with a two-year $200,000 startup grant from The California Wellness Foundation. An additional two-year grant of $250,000 from The California Wellness Foundation is an expression of confidence that its initial investment was effectively used in the community. The Weingart Foundation is providing $200,000 for the next two years to support its efforts in Southern California communities most deeply affected by poverty and economic inequity. Ballmer Group provided $150,000 over two years. Ballmer Group supports efforts to improve economic mobility and has invested significantly in direct services and capacity building in the Watts-Willowbrook area. GRoW@Annenberg has invested more than $50,000 this year as part of a multiyear commitment for the WLI GRoW Community Garden. It has also provided generous additional funding and technical assistance to enhance WLI community engagement and outreach. In addition, GRoW’s founder, Gregory Annenberg Weingarten, has awarded almost $100,000 directly to Watts community leaders working with WLI. “We are grateful for these new funders and grants because they help diversify WLI’s overall funding, helping us lead by example when encouraging WLI leaders to diversify their own funding streams,” Lompa said. The funds are quickly being put to use on the ground in Watts. WLI works with community leaders who are already making a difference and provides them with the tools, resources and training to be more effective — including tutorials on using tablets to keep their books as well as tips on navigating the Southern California policy and philanthropic landscape. The key for WLI, she said, is to listen to people who are acutely aware of what their neighborhood needs. WLI builds on this knowledge by responding with tangible help to sustain the leaders and their efforts. Leap told the story of WLI cohort member Amada Valle, a community organizer and advocate for residents of the Jordan Downs public housing development. “Amada is teaching women to sew and to create women-led businesses,” Leap said. “And what do you need if you’re teaching women to sew? Sewing machines.” Thanks to funds allocated by The California Wellness Foundation for direct service reinvestment, Valle received a grant from WLI to purchase six sewing machines. “You would have laughed if you had walked into the Luskin development office and seen all these boxes of sewing machines, all piled up,” Leap said. Doing good works is contagious, WLI has found. Los Angeles City Councilman Joe Buscaino donated office space to the institute. The Johnny Carson Foundation funded an MSW internship in Watts. The UCLA Luskin IT team offers technical support, bringing community leaders to campus for tutorials. 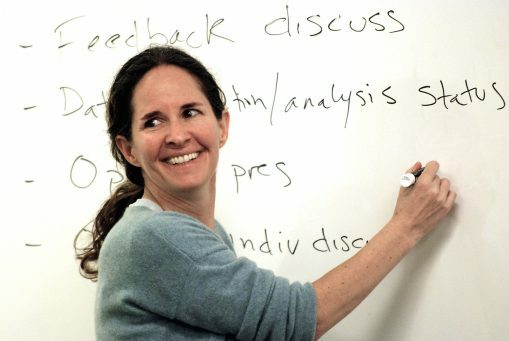 “That’s really our dream — to have everybody working together and leading within their community,” said Leap, who has been active in Watts for 40 years, since she attended UCLA for her BA, MSW and Ph.D.
Meredith Phillips, associate professor of public policy and sociology, is chair of the Luskin School's new undergraduate program in Public Affairs. The Luskin School’s world-class resources in public policy, social welfare and urban planning will soon be available to a much wider circle of UCLA students. Beginning in the fall of 2018, the School will offer a Bachelor of Arts in Public Affairs, a major that is unique in the University of California system. A clear public service ethos lies at the heart of the program, which combines critical thinking, social science methodology and deep engagement in the community. 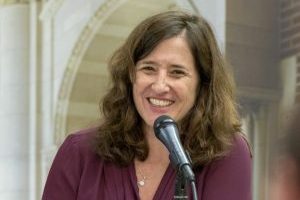 The major will connect the dots between theory and action, said Meredith Phillips, newly named chair of the undergraduate program. Phillips is an associate professor of public policy and sociology who has taught at UCLA for two decades. The impetus for the new program is simple, said UCLA Luskin Dean Gary Segura: “It’s part of our mission. The B.A. in Public Affairs will provide a wide-ranging education, Phillips said. Students will delve into power politics, microeconomics and human development. They will look at competing social science theories with a critical eye, and master tools for collecting and analyzing data. And they will learn to make written and oral arguments with clarity and conviction. Unique to the program, she said, is a yearlong capstone project that will immerse seniors in a field and research setting where they can apply their scholarship in the real world. “The students will be embedded in these organizations, learning from staff and clients about what’s going well, what’s not, and thinking about how to do things even better,” said Phillips, who has co-founded two educational nonprofits. “They will apply the skills they’ve learned in our classes to those experiences. And what they’re learning on the ground will undoubtedly turn out to be quite informative and will change how they think about what they’re learning in the classroom,” she said. The emphasis on service learning is what drew UCLA freshman Leyla Solis to explore the Public Affairs B.A. “All throughout high school, I did a lot of field work in areas I was passionate about,” said Solis, who attended a Northeast Los Angeles charter school that encouraged political engagement. Before coming to UCLA, Solis advocated at the United Nations for the rights of indigenous people, and developed a keen interest in effective governance and environmental law. A political science major, Solis had been considering the Luskin School’s minor offerings and even looking ahead to a graduate degree. Now she is mulling whether to go for a double major. “What the people in the Public Affairs Department are doing is not just studying it but going out and experiencing it firsthand,” said Solis, who mentors students from her charter school and tutors low-income children at Santa Monica’s Virginia Avenue Park. No other campus in the UC system offers a public affairs bachelor’s degree that draws from the three fields UCLA Luskin is known for: public policy, social welfare and urban planning. Faculty from each department were instrumental in developing the major, making it a true multidisciplinary partnership, Phillips said. Creation of the major had been in the works for several years, in response to rising student demand. The Luskin School’s current undergraduate courses draw around 1,500 students a year, and its minor programs are among the most popular at UCLA, said the School’s undergraduate advisor, Stan Paul. Last year, UCLA Luskin faculty voted unanimously to proceed with the undergraduate major. Jocelyn Guihama MPP ’03, deputy director of the Institute on Inequality and Democracy, helped turn this aspiration into reality, shepherding the effort through every stage. UCLA’s Academic Senate gave final approval on April 19, 2018, and the first of an expected 600 students will enter the major this fall, though many more are expected to take courses offered as part of the major. Students interested in learning more about the major can visit the UCLA Luskin site or email the department at undergraduateinfo@luskin.ucla.edu. The creation of an undergraduate major at a UCLA professional school is a rare occurrence, Segura said. “It represents a substantial addition to the undergraduate offerings at UCLA, and we think it’s going to be broadly attractive to a whole swath of incoming young people,” he said. The new major comes at a time when a growing number of students are seeking the scholarship and training to effect social change. “These young people are not simply resisting political and social forces with which they disagree — they’re also resisting knowledge-free policymaking,” Segura said of the spreading youth movement on such issues as gun violence, Black Lives Matter and immigration reform. “They want to be informed by facts. 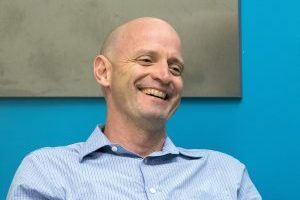 What we do at Luskin is provide them with the infrastructure to think analytically, with enough training so that they can solve the problems they’ve identified as important to their generation,” he said. Creation of the major greatly expands undergraduate access to UCLA Luskin’s faculty and resources, and it will also benefit the entire School, Segura said. “There will certainly be an infusion of energy that only undergraduates can bring. All of a sudden we’re going to have 600 change agents running around the building who are youthful and energized,” Segura said. 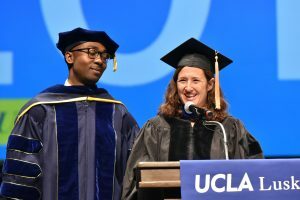 In addition, the hiring of new faculty members to support the expansion of class offerings has also opened up avenues for graduate research, he said, and master’s and Ph.D. students in UCLA Luskin’s other degree programs will gain access to teaching assistantships and other leadership roles. “I think from a scholarly perspective, from a resources perspective, from an experience perspective, it’s a big, big win for the School,” Segura said.